“You brought tears to my eyes – tears of joy – as I recalled songs I used to sing with my parents,” commented a new participant after the program. Three new people from Kaunoa’s Assisted Transportation program joined our monthly program. A returning participant gave us fragrant puakenikeni leis that she sewed. 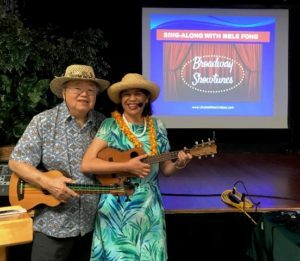 Thirty people signed up for my monthly Sing-Along with Mele Fong Series – Hawaiian Party Songs on Thursday, October 25, 2018 at Kaunoa Senior Center for adults 55 and better on Maui. This was the largest turnout we had so far during the year. During the new “Hawaiian history moment of the month” I talked about Princess Ka’iulani’s birthday on October 16, 1875. She was second in line to the throne of the Hawaiian kingdom, but never became queen. Ka’iulani broke the stereotype of Hawaiians being “savage” as she as a beautiful hapa-haole woman (part Scottish and part Hawaiian) who wore elegant Paris gowns and spoke English eloquently as she gave public speeches denouncing the overthrow of the monarchy in 1893 and pleaded to no avail with U.S. President Grove Cleveland to restore the monarchy. 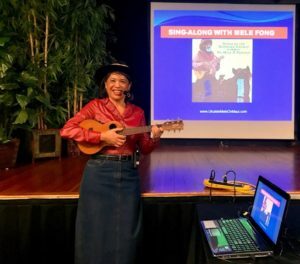 The “Sing-Along with Mitch Miller” format of projecting the song lyrics and ‘ukulele chords on a screen at the front of the room, and having my husband provide the u-bass line to fill in the lower tones to the higher pitched ‘ukulele worked great! Our wireless headsets and wireless instrument inputs made it possible to move around without being attached to cables to the amplifier. We continued the routine of telling the story behind each song and playing each song twice to reinforce what we learned. Koni Au I Ka Wai – Hum Ding-Ah Strum. Manuela Boy – Latin Strum. The Pidgin English Hula – I Wanna Rest/4And Strums. Tiny Bubbles – Hum Ding-Ah Strum. Princess Poopooly – I Wanna Rest/4And Strums. U.S.E.D. – Hum Ding-Ah Strum. Red Sails in the Sunset – Latin Strum. Pearly Shells – Hum Ding-Ah Strum. Ukulele Lady – Swing Strum. LISTEN TO THE RECORDINGS IN THE FREE ONLINE FAN CLUB and then schedule private webcam lessons or private lessons on Maui to get the song sheets and lesson on how to play it. 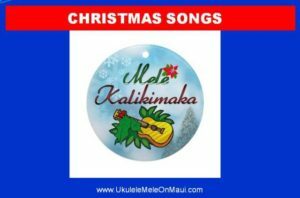 From the Hapa Haole Songs Category – Manuela Boy, Pearly Shells, Princess Poopooly, The Pidgin English Hula, Tiny Bubbles, and U.S.E.D. From the Pop Songs Category – Red Sails in the Sunset. 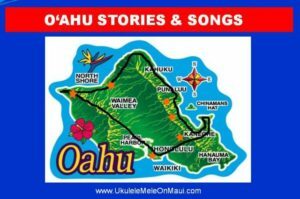 Advanced Online Lessons aka Complete Monthly Online Lessons – Hawaii Aloha, Koni Au I Ka Wai, Ukulele Lady and 47 other songs. Hapa Haole Songs, Vol. 1 – Ukulele Lady plus 5 other songs for advanced ‘ukulele players. Stay tuned for the next Sing-Along with Mele Fong Series – (Early) American Classics on Thursday, November 8. 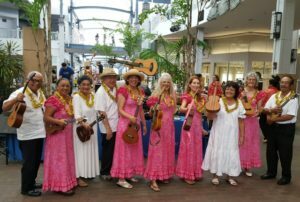 The Hawaiian Serenaders presented Story of the Ukulele and Concert on September 18 at Kihei Library on Maui. 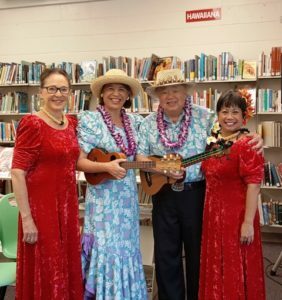 THE HAWAIIAN SERENADERS presented Story of the ‘Ukulele and Concert at 6:30 p.m. on Tuesday, September 18 at Kihei Public Library in south Maui. 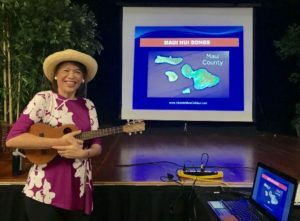 This was our second performance at Kihei Library in two consecutive years as sponsored by the University of Hawai’i Statewide Cultural Extension Program. There were thirty-two people who attended. 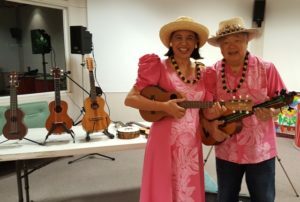 We like performing at Kihei Library with the air conditioning, easy parking, and regular programming on Tuesday nights. “Everyone gave you thumbs up,” commented the librarian after the show. View photos. New this time we used our own wireless headsets and wireless instrument inputs so we were free to move around without being attached to cables to the amplifier which made it easier to be heard when I moved to the instrument display table. 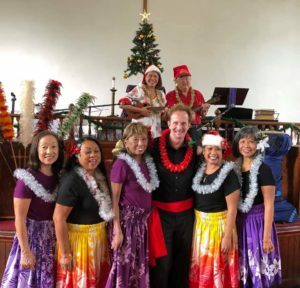 I was also pleased to answer questions about the evolution of Hawaiian music and the history of hapa haole music. One couple visiting from the mainland came to the show because of friends who told them about it when they met the week before at an outdoor fair – it’s fun to have groupies.